In what will be their first show in Cardiff in over 6 years – OH SEES – bring their latest studio album ‘Smote Reverser’ to the Tramshed this May (23). Formed in 1997 and with over 21 albums to their name and counting, the cult psychedelic rock outfit from San Francisco make the trip from the US for what promises to be an unmissable live return to the Welsh capital. In ‘Smote Reverser’, Oh Sees have spawned another frothy LP of head-destroying psych epics to grok and rock out to. You’ll notice the fresh dollop of organ and keyboard prowess courtesy of “Memory of a Cut Off Head” album and noted key-stabber Tom Dolas…the Quattrone/Rincon drum-corps polyrhythmic pulse continues to astound and pound in equal measure, buttressed by the nimble fingered bottom end of Sir Tim Hellman the Brave and the shred-heaven fret frying of John Dwyer, whilst Lady Brigid Dawson again graces the wax with her harmonic gifts. Aside from the familiar psych- scorch familiar to soggy pit denizens the world over, there’s a fresh heavy-prog vibe that fits like a worn-in jean jacket comfortably among hairpin metal turns and the familiar but no less horns-worthy guitar fireworks Dwyer’s made his calling card. Perhaps the most notable thing about ‘Smote Reverser’ is the artistic restlessness underpinning its flights of fancy. Dwyer refuses to repeat himself and for someone with such a hectic release schedule, that stretching of aesthetic borders and omnivorous appetite seems all the more superhuman. Hope you’re hungry as these platters are piled high! 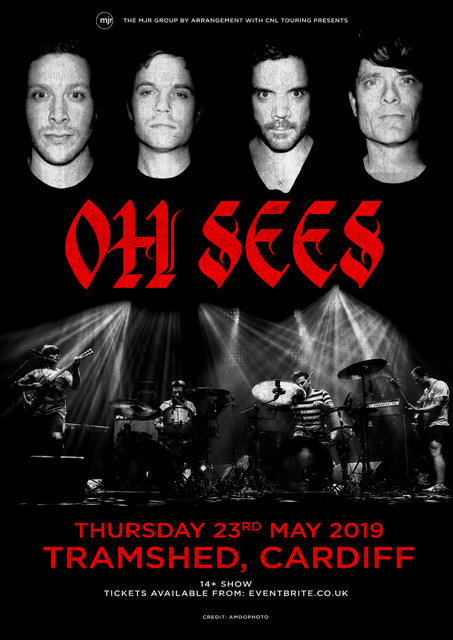 Don’t miss OH SEES as they bring their mind-melting new album to the live stage in 2019, with a select run of UK shows taking place this May.